Tiki Bar: To add a bit of island flair, a Tiki Bar is a fun and festive way to create that oasis for your yard. Palm Tree: Any oasis worth visiting will have a shady palm tree to add to the island feel. Ice Maker: No Tiki Bar is complete without a great ice maker. Who wants to constantly run in and out of the house to get ice? I use the AI-215 portable ice maker from Newair. This item can be purchased directly from Air-n-Water for $260. Comfortable Furniture: Think of arranging a few seating areas with chairs, benches with brightly patterned cushions and some large colorful pillows for the younger kids to sit on. Cooling System: When it gets hot outside but you want to entertain outdoors in your private oasis, you need a good cooling system. This will keep yourself and guests cool and comfortable and makes their visit more enjoyable. For those hot summer days and nights, the NewAir AF-520 18″ Outdoor Misting Fan is perfect for keeping everyone nice and cool. You can also purchase this item for $130 from the Air-n-Water website. Beverage Cooler: You may not have room for a full scale refrigerator for your Tiki Bar, so a smaller beverage cooler is the way to go. An oasis is not going to live up to its name if you do not have plenty of cold beverages to serve! Plants: Have you ever seen a beautiful tropical oasis without plenty of lush greenery? Strategically place your plants and flowers throughout the yard instead of bunching them up in one or two areas. This adds depth and character to the entire space. Music: Get your sound system to pipe some music to set that island oasis mood. How about the soundtrack from “South Pacific” or some Hawaiian music? If you are going to be outside in the warm weather, you must stay hydrated. Nobody enjoys being outdoors when it is hot and to be stuck with a warm drink. 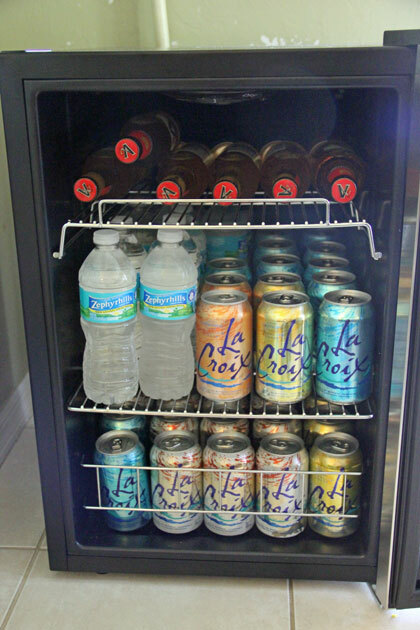 If you have a beverage cooler, you can keep your drinks nice and cold to keep your family and friends refreshed. I have the NewAir AB-1200 126 Can Beverage Cooler and it is just fantastic. It is small enough to fit in a compact area like my Tiki Bar but still holds a lot of cans. 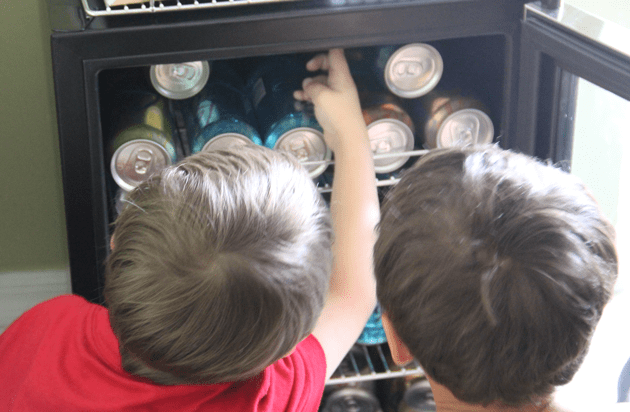 Even with a good sized crowd, you are able to keep them supplied with ice cold cans of their favorite drinks without the worry of running out. The sleek look of the stainless steel fits in well with most decor so you do not need to hide it away. 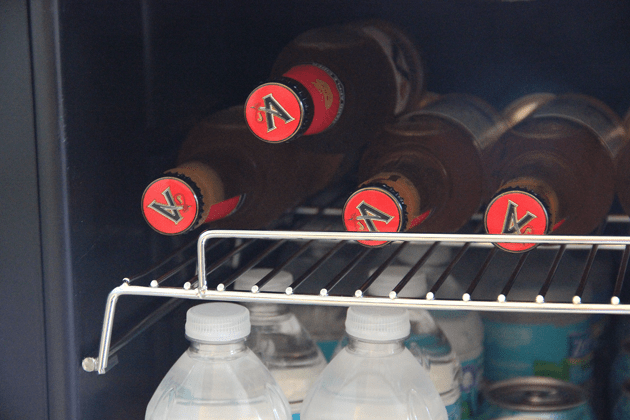 The NewAir AB-1200 126 Can Beverage Cooler has 5 removable racks, so you can arrange the cans however you like. It also has a good sized storage bin you can keep water, juice boxes, or adult beverages nice and cold. With 7 thermostat setting, you have the convenience of setting the temperature to what you want, and not what the manufacturer thinks you should have. The cooler is very well constructed, is easy to wipe clean and moves easily if you want to change its location. You can purchase the The NewAir AB-1200 126 Can Beverage Cooler for $300 from the Air-n-Water website. One USA reader will win a NewAir AB-1200 126 Can Beverage Cooler ARV $300. What item would be a must have for creating a backyard oasis for yourself?